Andhra Pradesh BSE AP SSC/10th Class Advanced Supplementary Examination Time Table/Schedule June/July 2015 Download available here. BSE AP successfully conducted 10th Class/SSC Examinations in March/April 2015 and the results declared on 20th May 2015 at 4pm. For the failed candidates the board conducting SSC/10th Class Advanced Supplementary Examinations from 16th June 2015. 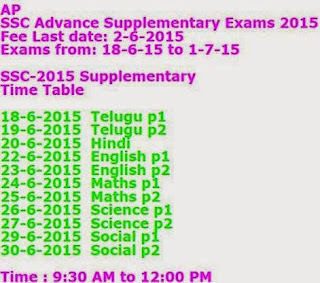 BSE AP conducting SSC/10th Class Advanced Supplementary Examinations from 18th June 2015 to 1st July 2015. Start with First language paper on 18th June 2015 and ending with OSSC Main Language Paper II (Sanskrit, Arabic, Persian) on 1st July 2015. Examination Timings: 9.30 to 12.00 Noon.